Hida Viloria | Audio Book Recording of Born Both Begins! Audio Book Recording of Born Both Begins! Starting tomorrow I’ll be in a studio for 5 days recording the audio version of my memoir—AH!!!!!! Can I really read that much out loud? It’s gonna be weird! But also cool. But weird…. P.S. 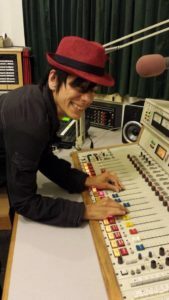 Haven’t started yet; this pic’s from a 2014 interview at KPFA Radio, in Berkeley. ← Quoted in People Magazine!